I actually never imagined myself getting married in the winter time, since I always dreamed of having an early fall rustic wedding with different shades of purple and sunflowers. Yet, the love of my life changed all of that. 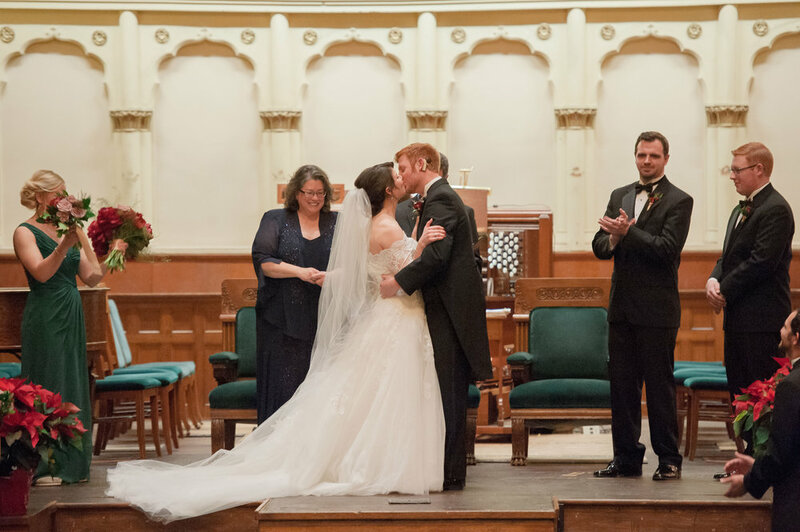 My husband wanted to do a New Years Eve wedding, and I admittedly thought it was pretty cliche, but it was more convenient for the guests to have a few days off over our wedding weekend, so I gave in and we set the wedding date: December 31, 2015. Our first task at hand was to find a wedding planner to help us with all the details. Melanie was the last planner we interviewed. She brought so many creative and unique ideas with an affordable price: I knew we could not go wrong with her. I knew wedding planning was not my forte, and Melanie did absolutely amazing with the whole planning process, making everything easy, enjoyable, and smooth. We are so grateful for her! 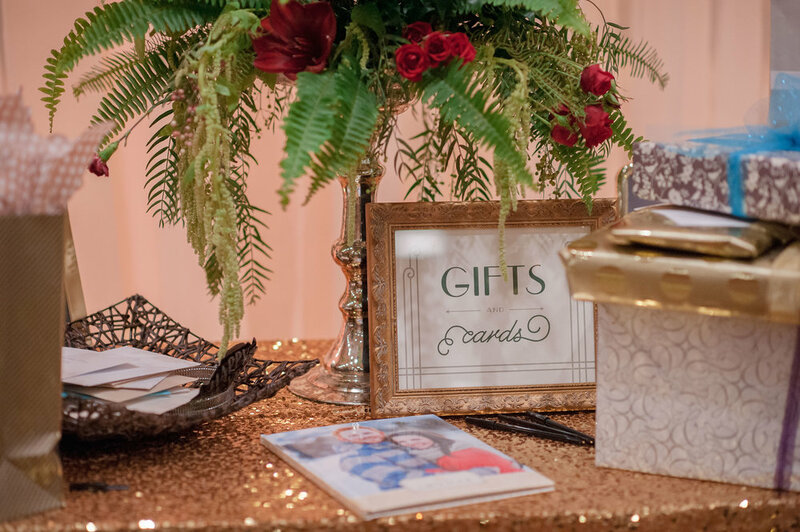 The theme of our wedding was inspired by the 1940s decade with the colors of forest green and sparkling gold. 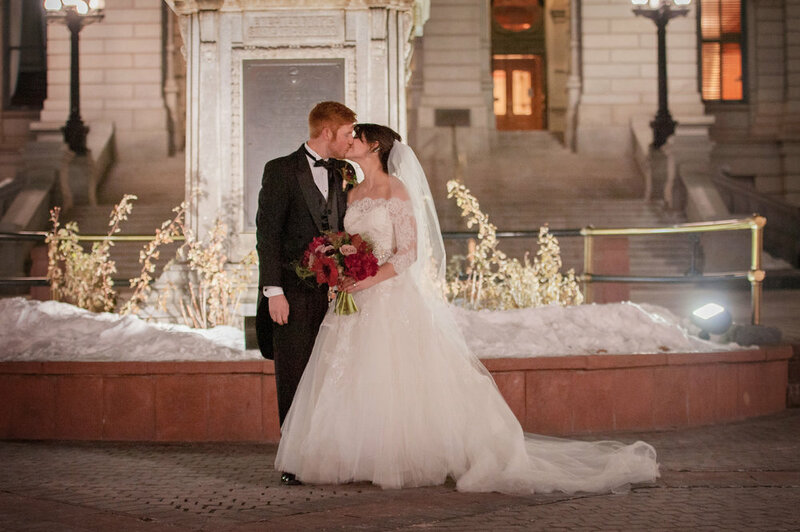 We got married in a gorgeous historic Presbyterian church right in downtown of Denver. In the church, it was already decorated with Christmas trees, red bows, and candles. I wore an A-Line sweetheart dress with a laced mid-sleeves jacket, and I had a long veil. My handsome husband and the groomsmen wore fancy black tuxes. 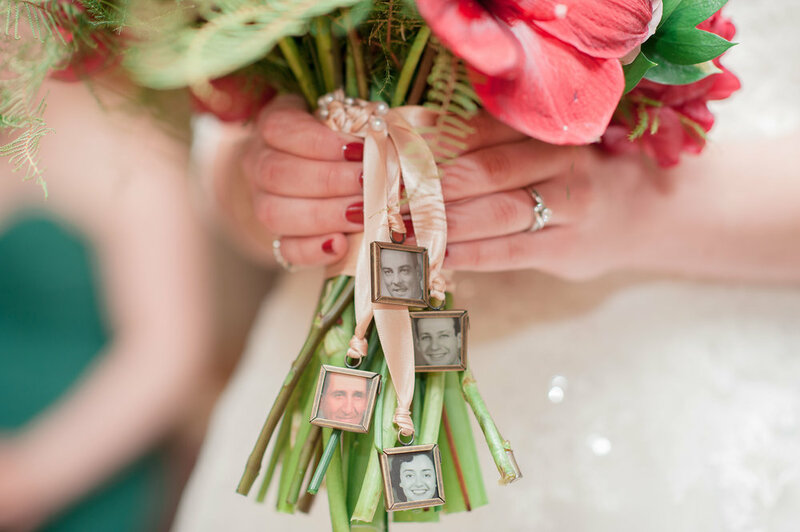 The bridesmaids wore forest green long one-shouldered dresses, and each one of them were given a pair of Toms based on their personalities along with different earrings. We all held beautiful boutiques with dark red and cream white flowers with gold ribbons. The groom and the groomsmen had dark purple boutonnieres. Our reception took place in the Downtown Denver Sheraton Hotel. 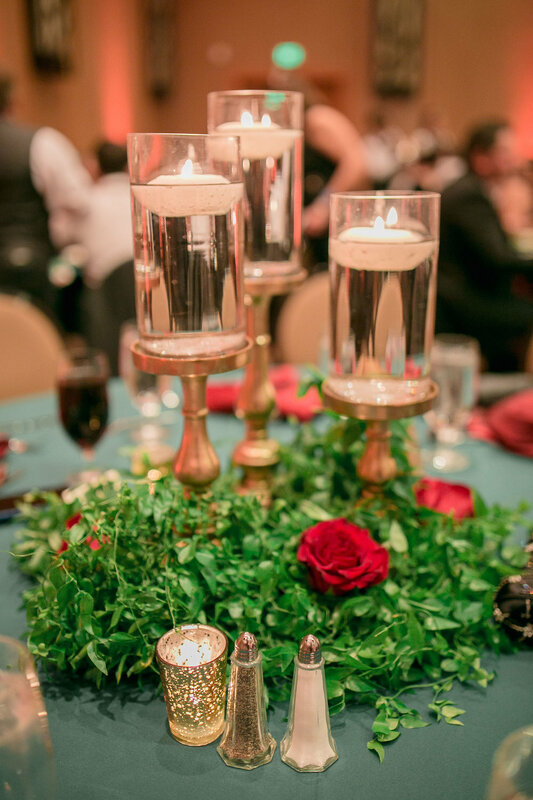 The guest tables held different shapes of gold vases with beautiful winter flowers on top of forest green table cloths and gold napkins. 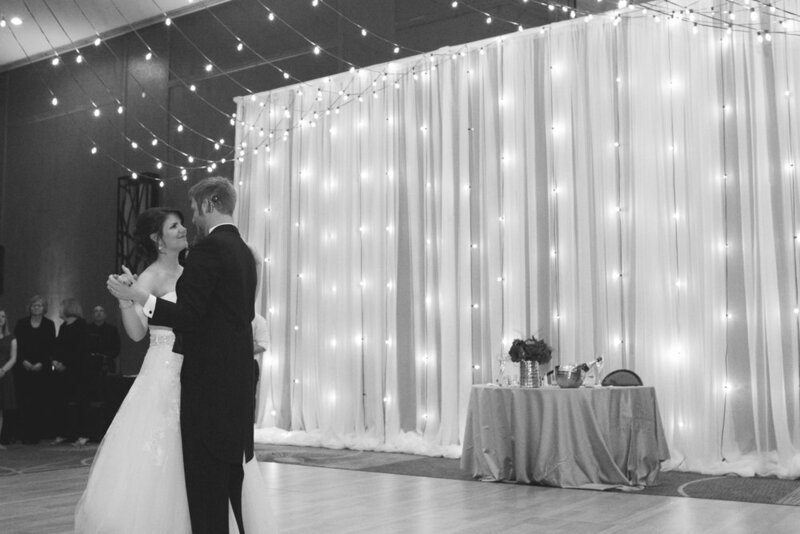 We had sparkling lights that drizzle down from the ceiling, providing a romantic and warmth feeling into the room. There were also peach-colored up-lights shining through the curtain and all around the perimeter of the ballroom. 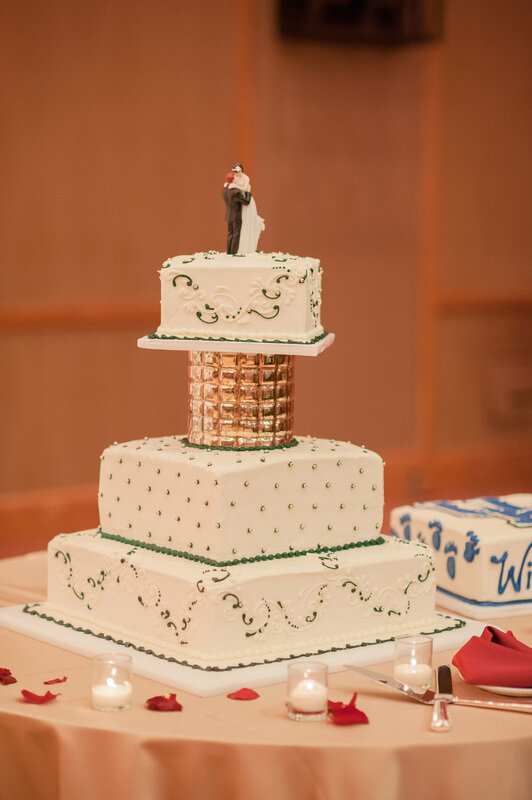 We had a three tier wedding cake along with a groom cake representing University of Kentucky, my husband’s favorite basketball team. It was absolutely breath-taking! 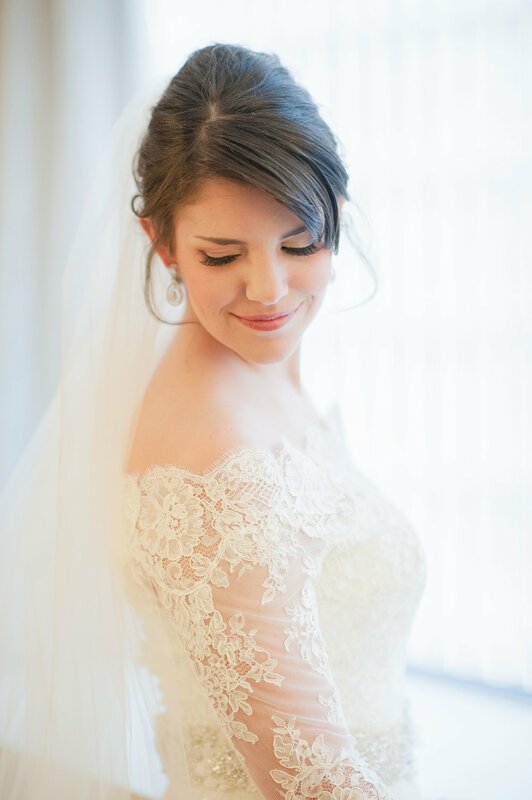 Our wedding was a dream come true, all thanks to our fabulous wedding planner, Melanie! We will never forget how beautiful and unique our day was. 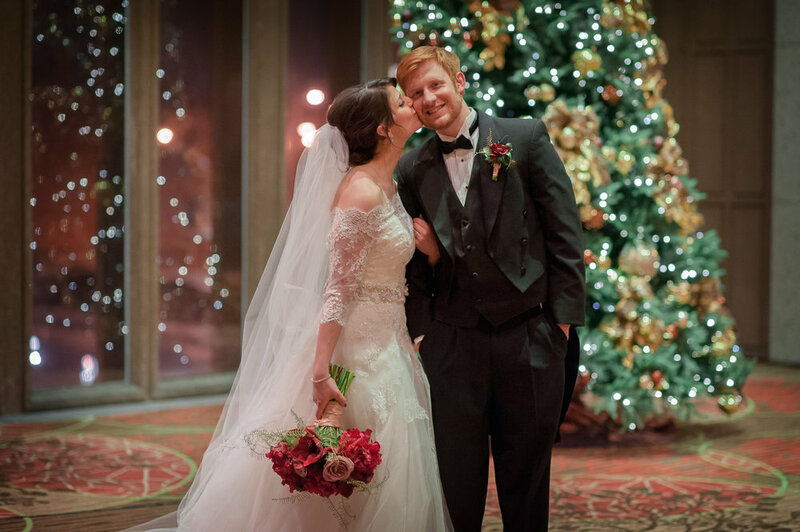 Our guests enjoyed every moment of it as we all danced all night long, celebrating our newly marriage and New Years!